This adaptive utensil is coated in Plastisol to help protect the user's teeth and gums. It makes the spoon bowl thicker and provides a buffer or barrier between the stainless steel of the spoon and the individual's teeth or gums. 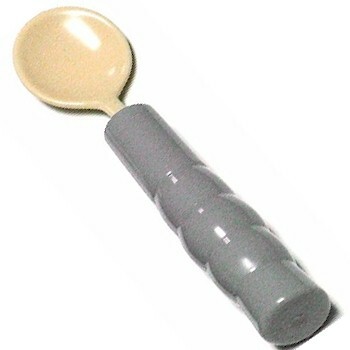 The Coated Weighted Soup Spoon's built-up handle is designed to help users with shaking hands or tremors retain better control of the utensil by lessening the effect of the tremors. The built-up handle comfortably fits your fingers and the contours in the handle provide easier grasping surface which assists in steadying the hand. These features are especially beneficial to people with Parkinson's disease, Essential Tremor or other neurological conditions that cause hand tremors. Dimensions: Spoon length is 7.5 inches. The spoon weighs approximately 8 ounces. Dishwasher safe. Not recommended for heavy biters. Please shop carefully, this item is non-returnable. Special Offer! 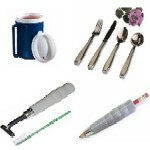 Save $20.80 over the price of these items purchased individually. Featuring the most recommended ADL products for those persons with Parkinson's disease and other illness that cause tremors. 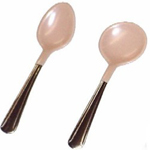 The Plastisol coating on these lightweight spoons protects the user’s teeth, gums and lips from users with uncontrollable movements. Comes 2 per package: one teaspoon and one soup spoon. 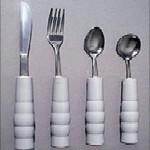 Heavily weighted utensils that help to stabilize the tremulous hand of the Parkinson patient and others with hand tremors. 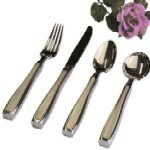 A stainless steel utensil with a heavy, gray vinyl handle that is designed with indentations to fit the fingers.